Egads, we’re up to Article Number 12 and I’m still not through with my first sub-assembly. At this rate, my children will have to carry me kicking and screaming to the assisted living section before I can even get to the upholstery! Nevertheless, progress is being made. This month I will try to finish up the front suspension assembly. Last month’s article discussed the joys of nickel plating the front suspension pieces. Now we get to mount these pieces onto the engine framework. At this point, in the spirit of full disclosure, I must admit that I leaned heavily on the http://www.inetogether.org website in order to assemble my front end. There you can find an excellent series of how to photos, hints, and tricks with regard to assemble of the front suspension pieces to the engine frame work. Another article that I used was written by Steve Kemp which gives a list and pictorial of every fastener used to assemble the engine frame to the picture frame and the suspension parts. I can forward it to anyone interested as a pdf file if requested. The first step in assembling the front suspension is to mount the “hard points” onto the picture frame/engine frame combination. These pieces transition from the sheet metal of the frames to the solid pieces of the suspension. 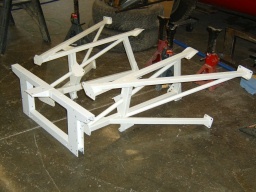 Once the hard points are mounted, the upper and lower A-arms can be mounted. The A-arms articulate via rubber bushings. 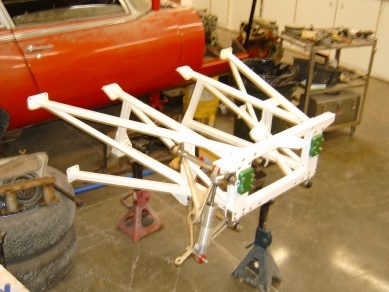 The bushings are ultimately clamped into a fixed position but should be left unclamped until the car is complete, standing on its tires, and loaded to a normal operating weight. In this “mid-laden” position, the rubber bushings are tightened. At this point, any suspension movement up or down twists the rubber of the bushing. If you do not get the bushings set at the proper neutral position, the twisting movement could be too great and cause them to tear. Suspension bushings made of polyurethane are quite the rage these days. As I am looking for a grand touring feel rather then wresting the last bit of cornering performance out of my car, I stayed with the rubber bushings. The poly bushings are stiffer and will transmit more of the road shock through the suspension, ultimately to the drivers seat bottom. This is not exactly what I desired! Also be warned that you will have to pay much closer attention to the lubrication of the poly bushings, as they do not twist but rather operate via rotation of a metal shaft within the bushing. They will squeak if not properly lubricated. Once I got the A-arms mounted, they were connected to the upright via ball joints. The original equipment ball joints were overly complicated, with springs and shims. A newer style is available for the lower ball joint that is all one piece and sealed as one unit. I understand it showed up with the XJ-6 and is backwards compatible with the E-type. Unfortunately, a one piece upper ball joint is not available. So I carefully assembled the various springs and shims per the shop manual. Once the upright is assembled, the axle stubshaft can be inserted and the inner and outer bearings can be mounted onto the shaft and into the splined wheel hub. Once again, the inetogether web site was invaluable in helping with this step. Prior to mounting the wheel hub, I pulled out the very trick cross drilled and vented brake rotors that I had purchased several years ago from http://www.classicjaguar.com. These are quite the eye candy! They will probably only marginally improve the braking but they will look great peaking through the wire wheels! 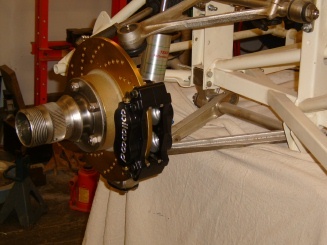 I also took this chance to mount my billet Wilwood disc brake calipers, also purchased from Classic Jaguar. More eye candy but in this case I hope to realize some nice improvement in the braking department from these babies. At this point they are just mounted into position. The installation of the hydrualic lines and addition of brake fluid will come much later. Next I turned my attention to the steering rack. This is a manual rack and pinion style unit. Under my policy of leaving no stone unturned, I took the rack completely apart. Although I’ve always heard of rack and pinion steering, I had never actually had one disassembled. It’s really pretty straightforward. 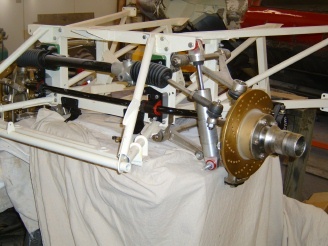 The shaft extending from the steering wheel, via several universal linkages, terminates inside the rack housing where a portion of the shaft has radial straight cut gears. This would be the pinion I believe. These gears mesh at right angles with a horizontal shaft, the rack, which has a long series of gear teeth laid out horizontally. As the pinion rotates, its draws the rack in a horizontal motion, which is turns pulls the front hubs through their turning motion. Quite simple really. I bead blasted the rack tube and painted it black. It turns out that the small gear housing for the rack and pinion is cast from aluminum. I had been told that glass beads would be too aggressive for cleaning up aluminum so I pulled out a 20# bag of walnut shells that I had purchased just for this application. Yes, that’s right. It seems that crushed walnut shells are just the ticket for loading into your bead blast cabinet and providing a gentle abrasive action to softer metals such as aluminum. The gear housing cleaned up quite nicely. I purchased to new rack bushing from Terrys Jaguar and pressed it into the end of the rack tubing. The rack was very tight in the bushing. Terry’s technical staff suggested that I use a disc brake cylinder hone to open up the bushing a tad. This worked out quite well. I nickel plated the exposed arms coming out of the end of the rack tube, bought new rubber gaiters and tie rod ends from Terrys, and completely the assembly of the steering rack. Finally I was able to mount the rack onto the picture frame and connect up the tie rod ends to the steering arms extending from the suspension uprights. Things were getting close now. I had purchased a new, stiffer sway bar from Classic Jaguar, along with (gulp) poly bushings. I decide d I could live with poly bushings at the sway bar connection to the picture frame, as it a secondary path for road induced vibration. I also purchased billet hard mounts for the steering rack connection to the picture frame, also from Classic Jaguar. None of the upgrades are irreversible and if I find things to be too harsh, I can go back to rubber. It was a very exciting moment as I attached the last component and stepped back to admire my handiwork. Finally, a completed sub-assembly! I took time to make a major photo shoot of the completed suspension assembly from various angles. Regretfully, I had to haul the assembly to my storage building, where it will reside until it is ready to be mated with the body shell.